Running from the beach to the hills and right through the city centre, the River Torrens Linear Park Trail is a first of its kind recreational public facility in Australia. The park stretches from Henley Beach to the Lofty Mountains. Cycle down the trail or take a leisurely stroll along the banks of the River Torrens and take in the sights and sounds of the city. 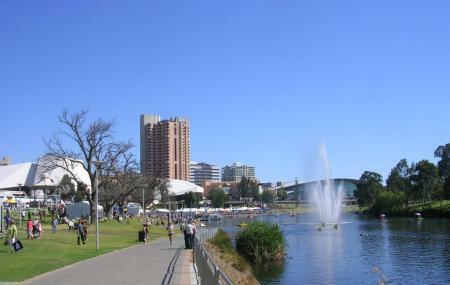 The trail runs past many landmarks like the Adelaide Festival Centre, Adelaide Convention Centre and Adelaide Zoo and the Adelaide Botanic Gardens in the city centre. An ideal place for a relaxed family outing one can feed the ducks or have a picnic by the river. The path is a shared pedestrian and cyclist trail and can be entered from several parts in the city. The most popular point of entry is Elder Park. One can hire bicycles from Linear Park Bicycle Hire, located in Elder Park. Please note that cyclists must give way to pedestrians and wheelchairs. Pedestrians should be considerate of cyclists on the trail. Pets are permitted on the trail but must be on a leash. Beware of intersections between the road and trail. Do not use bridges when covered in water. Follow the instruction on the signs along the trail. Recommended time to visit at 4 p.m.
For Elder Park, the nearest bus stop is King William Road. How popular is River Torrens Linear Park Trail? People normally club together Glenelg and Semaphore Jetty while planning their visit to River Torrens Linear Park Trail. This is an unpretentious track that wont have you in raptures but it has an easy old fashioned appeal. Mainly used by local dog walkers and joggers. Lovely examples of the last red gums that used to forest the plains before the arrival of Europeans. Best walked or cycled early in the day. Beautiful place to ride in the evening with an amazing breeze across your path. Great trail to walk, jog, run or bike ride. Some steep bits and some downhill bits, which I loved the most flying down hill on my bike. Goes from the city to hills in one direction and city to beach in the other.